Do you love animals? Do you need a comforter that looks elegant, warm and inviting but also highlights your wild nature? Then, you should consider the Kenya Zebra Leopard Silver and Black 8 Piece Comforter Set. 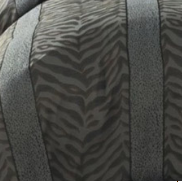 This comforter set features a series of stripes that alternate a wide zebra like pattern with a thin leopard like pattern. The set comes in silver and black tones that are so subtle they could almost be mistaken for different shades of blue. The set is wild enough for the most adventurous decorator but yet tasteful enough for those that want to make a more quiet statement. If you want a timeless wildlife inspired design for your queen or king sized bed, look no further because this is the set that you need.